IL-15 drives chronic inflammation in several human diseases. We have recently shown that IL-15 inhibits the immunosuppressive effects of TGF-β through blockage of the Smad3-signaling pathway. Data pointing to reciprocal interactions between TGF-β and CD4+ regulatory T cells led us to investigate the impact of IL-15 on the de novo generation and function of regulatory T cells in humans. Our data indicate that IL-15 does not counteract, but rather promotes the effect of TGF-β on the de novo generation of regulatory T cells (Treg). Thus, in the presence of TGF-β, IL-15 enhanced the acquisition of regulatory functions by CD4+CD25− T cells stimulated by anti-CD3 and anti-CD28 Abs. In contrast, IL-15 impaired the functions of Tregs by acting on effector CD4 and CD8 T cells. Accordingly, in the presence of IL-15, proliferation and IFN-γ production by peripheral CD4 and CD8 T cells could not be efficiently inhibited by Tregs. IL-15-induced resistance of effector T cells to Tregs resulted from activation of the PI3K signaling pathway but did not involve the rescue of effector T cells from apoptosis. Altogether, these data point to the ambiguous role of IL-15 in the control of Treg functions. This dual role may be instrumental to mount rapid but transient proinflammatory immune responses against pathogens but may become deleterious in situations associated with protracted IL-15 over-expression. Interleukin-15 plays pleiotropic functions at the interface between innate and adaptive immunity and participates both in homeostatic and proinflammatory regulation of the immune system. IL-15 is critical for the differentiation and/or survival of several immune cell subsets, including NK cells, memory CD8 T cells, and intraepithelial lymphocytes. IL-15 is also a potent inducer of the effector phase of the immune response, notably by stimulating dendritic cell maturation as well as NK and CD8 T cell cytotoxicity (1, 2). We have recently shown that IL-15 impairs the immunosuppressive effects of TGF-β through inhibition of the Smad3 signaling pathway (3), which plays a key role in tipping the immune balance toward tolerance (4, 5). Because IL-15 is secreted early in response to intracellular pathogens (6), its inhibitory effect on TGF-β-mediated regulation may further promote protective effector immune responses. Conversely, persistent expression of IL-15, observed in several autoimmune or chronic inflammatory diseases (7), may durably impair the regulatory functions of TGF-β and thereby create a vicious circle perpetuating inflammation. TGF-β plays a pivotal role in maintaining immune homeostasis via the direct control of activation, proliferation, differentiation, and survival of immune T cells but also via its effects on regulatory T cells (Treg)4 (8, 9). Although not required for the thymic development of natural occurring CD4+CD25+FOXP3+ Treg, TGF-β helps the in vitro and in vivo de novo generation of induced Treg from naive CD4+CD25− T cells (reviewed in Ref. 10 and 11). TGF-β is necessary in the periphery for the maintenance of murine Treg and sustains their suppressor functions and FOXP3 expression (12, 13, 14). The direct contribution of TGF-β in their suppressive functions remains, however, controversial. In most in vitro experiments TGF-β is not essential for the suppressor functions of Treg (15, 16). Yet, a role of membrane-bound TGF-β has been occasionally reported (17). Data obtained in vivo are more contentious. Antagonizing TGF-β abolished the therapeutic effect of murine Treg in some but not all in vivo models (18, 19, 20, 21). The role of Treg-derived TGF-β was important in one model implicating induced Treg (20) but not in other models depending on naturally occurring Treg where functional TGF-β was produced by another cellular source (19, 21). Notably, TGF-β was necessary to stimulate the production of IL-10 by the subset of Treg present in the intestine (22). Our recent demonstration that IL-15 exerts an inhibitory effect on TGF-β signaling led us to investigate the impact of IL-15 on the de novo generation and/or function of CD4+CD25+ Tregs. Peripheral samples were from healthy volunteers donors. Informed consent was obtained from all patients before the study. All experiments were approved by local ethics committee. In all in vitro assays, cells were cultured in RPMI 1640 medium supplemented with 10% AB human serum (Sigma-Aldrich), 1% sodium pyruvate, 1% non essential amino acids, 1% HEPES buffer, 5 × 10−5 M β-ME, and 40 μg/ml gentamicin (Invitrogen). Purified recombinant human IL-15, IL-2, and TGF-β (R&D Systems) and mAbs anti-human CD3 (UCHT1) and CD28 (BD Biosciences) were used for in vitro lymphocyte culture. The following inhibitors of signaling pathways were used: JAK3 inhibitor I (Calbiochem) at 100 μM, inhibitor of JNK (SP600125; BIOMOL International) at 10 μM, inhibitor of p38 MAPK (SB203580; Calbiochem) at 1 μM and inhibitors of PI3K/Akt pathway, Wortmaninn (Sigma-Aldrich) at 0.5 μM, and Ly294002 (Sigma-Aldrich) at 20 μM. The following mAbs were used for flow cytometry analysis: FITC- and Cy-Chrome-conjugated anti-human CD3, CD4, and CD8 (BD Biosciences); PE-conjugated anti-human CD45RA, CD45RO, phospho-Akt (pT308) (BD Biosciences); anti-human CD25 (Miltenyi Biotec); and anti-human FOXP3 (FOXY, eBiosciences or 259D/C7, BD Biosciences). PBMC were isolated on Ficoll-Hypaque gradient and lymphocyte subsets were separated using magnetic beads (CD3, CD8, and anti-PE microbeads, and CD4+CD25+ Regulatory T cell Isolation Kit, Miltenyi Biotec). For CD3+, CD8+, CD4+CD25−, CD4+CD45RA, CD4+CD45RO, CD8+CD45RA, and CD8+CD45RO isolated subsets, purity ranged from 90 to 98%. CD4+CD25+ Tregs were collected with a purity ranging from 67 to 84%. For de novo generation of regulatory T lymphocytes, purified CD4+CD25− peripheral T lymphocytes were stimulated for 5 days in 24-well plates (106/well) with plate-bound anti-CD3 Ab (1 μg/ml) and soluble anti-CD28 Ab (1 μg/ml) in the presence or not of TGF-β (0.5 or 10 ng/ml) and/or IL-15 (10 ng/ml) and/or IL-2 (300 UI/ml). The suppressive functions of Tregs were tested in coculture experiments in 96-well plates coated with 0.5 μg/ml UCHT1 (Life Technologies). CD4+CD25−, CD3+, CD8+, or naive and memory T subsets (105/well) were plated and added with 1 or 0.25 × 105/well of autologous induced or natural CD4+CD25+ T cells in a final volume of 200 μl for 4 to 5 days. For proliferation studies, uptake of [3H]thymidine (Amersham Biosciencs) was measured 18 h after adding 0.4 μCi/well. Cells were harvested and radioactivity was counted in a scintillation counter. For analysis of apoptosis, cells were stained with FITC-annexin V and propidium iodide (TACS Annexin V-FITC; R&D Systems) according to the manufacturer’s instructions and the percentage of apoptotic cells positive both for Annexin V and propidium iodide was determined by flow cytometry. To analyze apoptosis of effector cells during coculture with Treg, responder cells were stained before culture with CFSE (Molecular Probes) at a concentration of 0.5 μM. After 4 days, cells were harvested, labeled with PE-Annexin V (BD Biosciences) according to the manufacturer’s protocol and the percentage of apoptotic Annexin V+ cells was determined by flow cytometry. For IFN-γ detection, capture ELISA was performed on supernatants of cells using Human IFN-γ ELISA Set (BD Biosciences) according to manufacturer’s instructions. The limit of detection was 23 pg/ml. Cells (2 × 105) were incubated with FITC, PE, or PE-Cy5.5 conjugated mAbs to human CD3, CD4, CD8, CD25, CD45RA, and CD45RO Abs for 20 min at 4°C. For intracellular FOXP3 detection, cells stained with FITC-conjugated mAb to CD25 were fixed, permeabilized using eBioscience FOXP3 Staining Buffer Set (eBioscience) or Human FOXP3 Buffer Set (BD Biosciences), and labeled with PE-conjugated anti-human Foxp3 (Biosciences or BD Biosciences) or control isotype (BD Biosciences). For intracellular phospho-Akt detection, cells were fixed and permeabilized using Fix Buffer I and Perm Buffer III and labeled with PE-conjugated anti-human phospho-Akt or control isotype (BD Biosciences). For intracellular IFN-γ detection, cells were treated with GolgiStop for the last 6 h of culture, fixed, and permeabilized using BD Cytoperm/Cytofix plus kit and labeled with PE-conjugated anti-human IFN-γ or control isotype (BD Biosciences). Analyses were performed with a FACS Vantage flow cytometer using the CellQuest software (BD Biosciences). Whole-cell or nuclear extracts were obtained from stimulated CD3+ T cells using the Nuclear Extract kit (Active Motif) according to manufacturer’s instructions. Proteins (20 μg) were separated on an 8% sodium-dodecyl-sulfate (SDS-PAGE) gel, transferred to nitrocellulose membranes, and labeled with mAbs against human NFATc2 (Santa Cruz Biotechnology) or human β-actin followed by HRP-conjugated anti-mouse Ab (Cell Signaling Technology). Visualization was performed using ECL system (ECL plus, Amersham Biosciences). Values obtained in the different experiments were compared by the nonparametric Mann-Whitney U test. Statistical significance was assigned to a value of p < 0.05. In vitro generation of CD4+CD25+ Tregs was studied after a 5-day in vitro stimulation of purified CD4+CD25− peripheral T lymphocytes with anti-CD3 and anti-CD28 Abs in the presence or not of TGF-β and/or IL-15. The regulatory function of the generated cells was then evaluated by testing their capacity to inhibit the proliferative response of autologous CD4+CD25− T cells to immobilized anti-CD3 Ab. Stimulation of purified CD4+CD25− peripheral T lymphocytes with anti-CD3 Abs induced the appearance of a very high proportion of cells expressing FOXP3 mRNA and protein but these cells did not exert any suppressive effects (Fig. 1⇓A and data not shown), a finding consistent with the observation that FOXP3 expression can merely reflect T cell activation in humans (23, 24). Adding TGF-β during the 5-day stimulation had no significant effect on the level of expression of FOXP3 protein or percentage of CD25+ FOXP3+ T cells (Fig. 1⇓A). In contrast, the latter cells now demonstrated a significant inhibitory effect on the proliferative response of CD4−CD25− autologous T cells analyzed at day 5 (Fig. 1⇓B). Comparable results were obtained when thymidine uptake was measured at earlier time points (day 3) (data not shown). Adding IL-15 had no significant effect on FOXP3 protein expression compared with cultures containing TGF-β alone (Fig. 1⇓A). 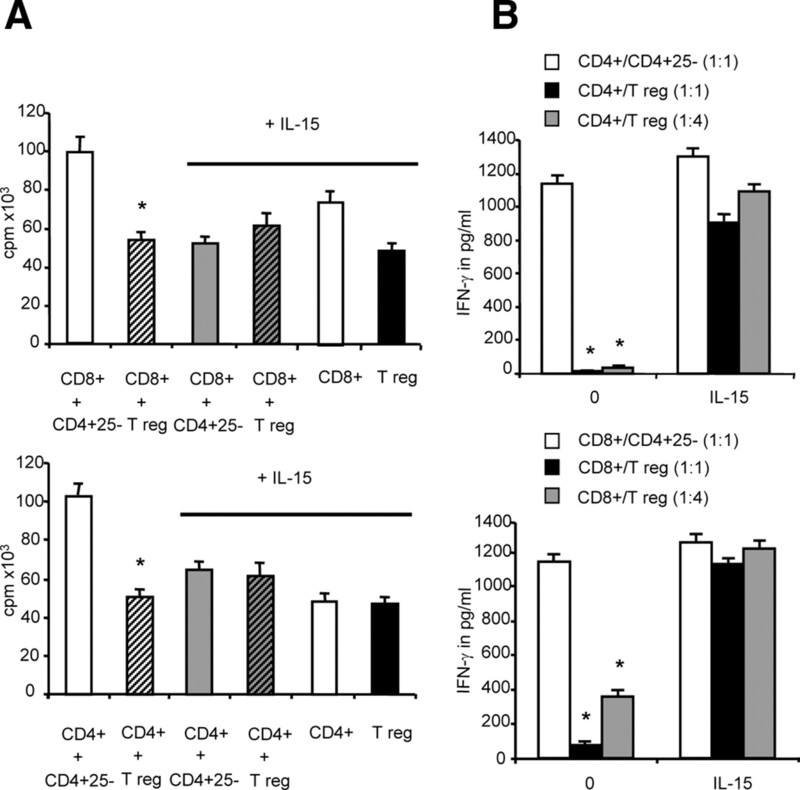 Yet, CD25+FOXP3+ T cells generated in the presence of both IL-15 and TGF-β exerted a significantly stronger inhibitory effect on the proliferation of CD4+CD25− T cells than Tregs generated in the presence of TGF-β alone (Fig. 1⇓B). Comparable results were obtained when IL-15 was replaced by IL-2, but exogenous IL-2 did not enhance significantly the effect of TGF-β on the acquisition of regulatory functions (Fig. 1⇓). IL-15 does not impair in vitro conversion of conventional T lymphocytes into Tregs. Purified CD4+CD25 −peripheral T lymphocytes were stimulated with immobilized anti-CD3 Ab (1 μg/ml) and soluble anti-CD28 Ab (1 μg/ml) in the presence or not of TGF-β (10 ng/ml) and/or IL-15 (10 ng/ml) and/or IL-2 (300 UI/ml). A, Intracytoplasmic FOXP3 was analyzed by flow cytometry. The analysis was performed on the lymphocyte gate. Results from one representative of three experiments are shown. B, The suppressive function of the generated cells was evaluated by testing their capacity to inhibit the proliferative response of autologous CD4+CD25− T cells stimulated with immobilized anti-CD3 Ab (0.5 μg/ml) at a ratio 1:1 of regulatory to responsive T cells. Results are from three independent experiments. ∗, p < 0.05 when compared with coculture with unstimulated CD4+CD25− cells. 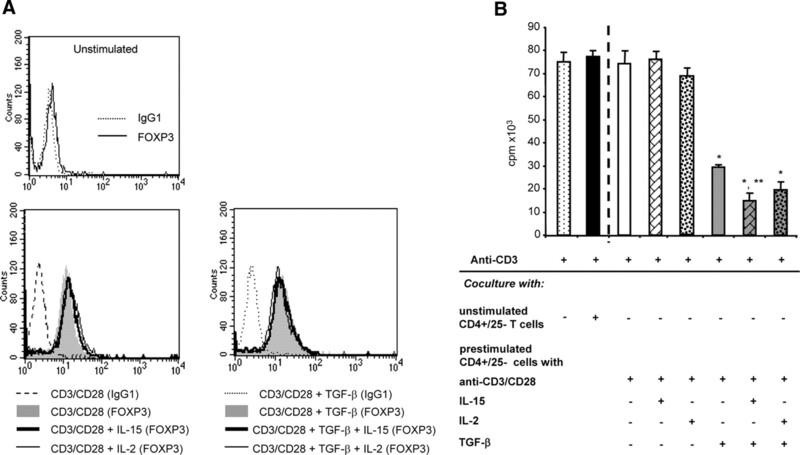 ∗∗, p < 0.05 when compared with coculture with CD4+CD25− cells stimulated with TGF-β. To test the impact of IL-15 on the suppressive capacities of natural CD4+CD25+ Treg, the latter cells were isolated from peripheral blood of healthy donors and their suppressive effects on the proliferation and secretion of IFN-γ were tested on autologous CD4+ or CD8+ T cells stimulated via their TCR, in the presence or absence of IL-15. As shown in Fig. 2⇓A, adding CD4+CD25+ T cells to CD8+ or CD4+CD25− purified T cells at a ratio of 1:1 regulatory to responsive T cells inhibited their proliferative response to immobilized anti-CD3 by 50%. CD4+CD25+ cells had an even more striking effect on the production of IFN-γ, which was abolished in CD8+ autologous T cells at both ratios of 1:1 and 1:4 and abolished or reduced by 80% in CD4+ T cells. In contrast, in the presence of 10 ng/ml IL-15, CD4+CD25+ T cells lost their inhibitory effect on the proliferation and production of IFN-γ (Fig. 2⇓, A and B). Because IL-15 could stimulate the proliferation of CD4+CD25+ T cells, the lack of inhibitory effect of the latter cells on T cell proliferation in the presence of IL-15 may be partly ascribed to the break of their anergic state (Fig. 2⇓A, last columns). Yet, Peluso et al. (25) have recently shown that IL-15 reverted the suppressive effects of CD4+CD25+ T cells on the proliferation of CFSE labeled CD4+ and CD8+ lymphocytes. Our results concerning IFN-γ secretion confirm that the effect of IL-15 cannot only be ascribed to a break of anergy of the Treg. Thus, the inhibitory effect of Tregs on IFN-γ secretion was reverted by IL-15 (Fig. 2⇓B), while IL-15 did not induce any IFN-γ secretion in CD4+CD25+ T cells stimulated or not with anti-CD3 (data not shown). Collectively, these data suggest that IL-15 can directly interfere with the regulatory function of CD4+CD25+ cells and/or the sensitivity of responder cells to Tregs. IL-15 impedes the suppressive capacities of natural CD4+CD25+ Tregs. CD4+CD25+ Treg were isolated from peripheral blood of healthy donors and their suppressive effects were tested on autologous CD4+CD25− or CD8+ T cells stimulated with immobilized anti-CD3 in the presence or absence of IL-15. A, Proliferative responses were assessed by [3H]thymidine uptake. Results are from three independent experiments. B, IFN-γ secretion was evaluated in supernatants of cocultures by an ELISA test. Results are representative of three independent experiments. ∗, p < 0.05 when compared with control cocultures with CD4+CD25− cells. Consistent with our data indicating that IL-15 does not impair the in vitro generation of CD4+CD25+ Treg, several studies have recently shown that IL-15 can expand natural CD4+CD25+ regulatory T lymphocytes while preserving their optimal suppressive potency (26, 27). These results suggested that IL-15 did not exert its inhibitory effect by acting directly on Treg but rather by affecting the sensitivity of responder T cells to the suppressor effects of Treg. To test this hypothesis, CD4+ and CD8+ peripheral lymphocytes were incubated or not with IL-15 during 24 h. After extensive washings, the cells were stimulated with anti-CD3 Ab and the inhibitory effects of CD4+CD25+ Treg were assessed. Proliferation experiments showed that the suppressive effect of Tregs on peripheral T cell proliferation was significantly reduced when conventional lymphocytes had been first incubated with IL-15, an effect more particularly obvious in the CD8+ subset (Fig. 3⇓A). In addition, preincubation with IL-15 prevented very efficiently the suppressive effect of Treg on IFN-γ secretion in both CD4+ and CD8+ T lymphocytes (Fig. 3⇓, B and C). At a 1:1 ratio, the inhibitory effect of Treg cells on IFN-γ secretion, assessed either by intracytoplasmic staining (Fig. 3⇓B) or by ELISA (Fig. 3⇓C) in the culture supernatants was reduced drastically when lymphocytes had been previously incubated with IL-15 (p < 0.001). Altogether, these data demonstrate that IL-15 renders conventional CD4+ and CD8+ T lymphocytes resistant to the suppressive effects of CD4+CD25+ Treg. IL-15 renders conventional T lymphocytes resistant to the suppressive effects of natural CD4+CD25+ Tregs. CD4+ and CD8+ peripheral lymphocytes were incubated or not with IL-15 (10 ng/ml) during 24 h. Cells were then washed and stimulated with anti-CD3 Ab (0.5 μg/ml) and the inhibitory effects of peripheral CD4+CD25+ Treg were assessed on proliferation and IFN-γ production. A, Proliferative responses were measured at day 5 by [3H]thymidine uptake. Results are from six independent experiments. ∗, p < 0.05 when compared with the condition without IL-15 preincubation. B, Intracytoplasmic IFN-γ staining was analyzed by flow cytometry in the lymphocyte gate. Results from one of three independent experiments are shown. Numbers indicate the percentages of positive IFN-γ cells. ∗, p < 0.05 when compared with control cocultures with CD4+CD25− cells. C, IFN-γ secretion was evaluated in supernatants of cocultures by an ELISA test. Results are from three independent experiments. ∗, p < 0.05 when compared with control cocultures with CD4+CD25− cells. Recent data indicated that conventional T cells from NFATc2−/− mice are unresponsive to CD4+CD25 Treg suppression (28). We hence tested whether IL-15 acts on responder cells by modulating NFATc2 pathway. IL-15 had no effect either on NFATc2 protein expression or on NFATc2 induced translocation (Fig. 4⇓A). The mechanism implicated in IL-15 induced resistance of responder cells to suppression was therefore addressed using inhibitors of the major signaling pathways activated by IL-15. As shown in Fig. 4⇓B, only inhibitors of the PI3K/Akt pathway (Wortmaninn and Ly294002), added during the 24-h preincubation of responder cells with IL-15, restored the capacity of the latter cells to respond to the inhibitory effect of Treg on both T cell proliferation and IFN-γ secretion. Notably, in the absence of Treg, responder cells preincubated with IL-15 and PI3K inhibitors exhibited a proliferative response and IFN-γ secretion comparable to that of control responder cells, eliminating a direct effect of these inhibitors on their effector functions (data not shown). Collectively, these data indicate that activation of the PI3K pathway by IL-15 renders T lymphocytes resistant to the inhibitory effects of Treg. IL-15 acts on conventional T lymphocytes through activation of PI3K pathway. A, Peripheral CD3+ T lymphocytes were incubated or not with anti-CD3 (5 μg/ml) in the presence or absence of IL-15 (10 ng/ml) during 24 h. Expression of NFATc2 was evaluated by immunoblotting on total cell extracts (upper panel) and nuclear translocation of NFATc2 was assessed on nuclear extracts (lower panel). B, CD3+ peripheral lymphocytes were incubated or not with IL-15 (10 ng/ml) in the presence JAK3 inhibitor ((-) JAK3), SP600125 (SP), SB203580 (SB), Wortmaninn (Wort), or Ly294002 (Ly) during 24 h. The cells were then washed and stimulated with anti-CD3 Ab and the inhibitory effects of CD4+CD25+ Treg on proliferation (upper panel) and IFN-γ secretion (lower panel) were assessed. Results are representative of three independent experiments. ∗, p < 0.05 when compared with control cocultures with CD4+CD25− cells. The PI3K can also be activated by the related cytokine IL-2 which shares the β and γ-chains of its receptor with IL-15 (29). Yet, the latter chains and the private α-chains of IL-2 and IL-15 receptors are differentially expressed on T cell subsets (30). The effects of IL-15 and IL-2 were therefore compared on CD4+ and CD8+ naive and memory T cell subsets. IL-15 rendered both CD8+ T cell subsets resistant to the inhibitory effects of Treg and had a minor but significant effect on CD4+ subsets. In contrast, IL-2 acted preferentially on memory T lymphocytes, notably CD4+. Comparable results were obtained when analyzing proliferation (Fig. 5⇓A) and IFN-γ secretion (Fig. 5⇓B) by responder cells. Notably, the differential effects of IL-2 and IL-15 in the various T cell subsets corroborated their capacity to induce PI3K activation as demonstrated by flow cytometry analysis of Akt phosphorylation (Fig. 5⇓C). IL-15 acts preferentially on T CD8+ lymphocytes. CD4CD45RA, CD4CD45RO, CD8CD45RA, and CD8CD45RO lymphocytes were incubated or not with IL-15 (10 ng/ml) or IL-2 (300 IU/ml) during 24 h. A, Cells were then washed and stimulated with anti-CD3 Ab (0.5 μg/ml) and the inhibitory effects of peripheral CD4+CD25+ Treg were tested at ratio 1:1. Proliferative responses were assessed at day 4 by [3H]thymidine uptake. Results are from three independent experiments. ∗, p < 0.05 when compared with the condition without IL-15 preincubation. B, IFN-γ secretion was evaluated in supernatants of cocultures by an ELISA test. Results are from three independent experiments. ∗, p < 0.05 when compared with control cocultures with CD4+CD25− cells. C, Intracytoplasmic staining of p-Akt was monitored by flow cytometry. Results from one of three independent experiments are shown. Reigniting an old debate, Pandiyan et al. (31) have recently suggested that CD4+CD25+ Treg exert their suppressive effects by depriving effector T cells of life-supporting IL-2, thereby inducing apoptosis of effector T cells. These authors further showed that the effect of IL-2 involved the PI3K/Akt pathway and that IL-2 could be replaced by other γc cytokines, including IL-15. We were, however, unable to demonstrate that suppression of effector cells was associated with their significant apoptosis (Fig. 6⇓). Thus, no increase in the total percentage of apoptotic cells stained by propidium iodide and annexin V was observed in cocultures of responder and Treg cells compared with responder cells stimulated alone (Fig. 6⇓A), despite the strong inhibitory effect of Treg on T cell proliferation (Fig. 6⇓, B and D). To further confirm the lack of Treg-induced apoptosis of responder cells, the latter cells were labeled before culture with CFSE. CFSE staining decreased in a large fraction of responder cells stimulated alone but not in the presence of Treg, confirming their suppressive effect (Fig. 6⇓B). The percentage of Annexin V+ CFSE+ cells however did not increase in the presence of Treg (Fig. 6⇓C). 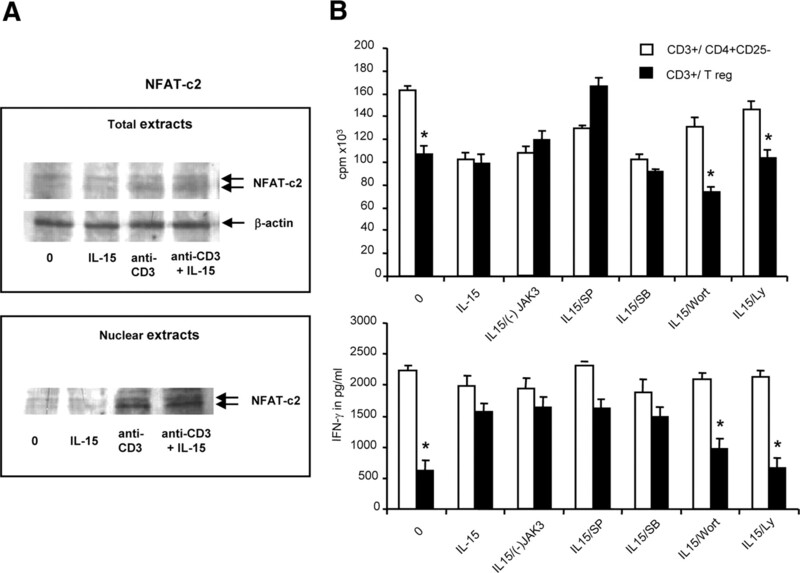 Furthermore, inhibitors of PI3K failed to induce any significant apoptosis in CD4+CD25− responsive cells stimulated by anti-CD3 and anti-CD28 Abs (Fig. 6⇓A) while they exerted a strong inhibitory effect on their proliferation (Fig. 6⇓D). Tregs do not induce apoptosis of responder cells. A, CD4+CD25− cells were stimulated by immobilized (0.5–1 μg/ml) anti-CD3 Ab and soluble (1 μg/ml) anti-CD28 Ab in the presence or not of CD4+CD25+ cells or in the presence of the PI3K inhibitor Ly294002 (Ly) and the percentage of apoptotic cells positive for both annexin V and propidium iodide was assessed after a 5-day culture. Data are representative of three distinct experiments. B, CD4+CD25− T cells were labeled with CSFE and left either not stimulated (NS, dotted line) or stimulated with immobilized anti-CD3 (0.5 μg/ml) and soluble anti-CD28 (1 μg/ml) Abs for 3 days, in the presence of either unlabeled CD4+CD25− cells (S, gray-filled histogram) or unlabeled CD4+CD25+ cells at 1:1 ratio (S, thick full line). The same result was obtained with soluble anti-CD3 (0.75 μg/ml) and anti-CD28 (4 μg/ml) Abs. 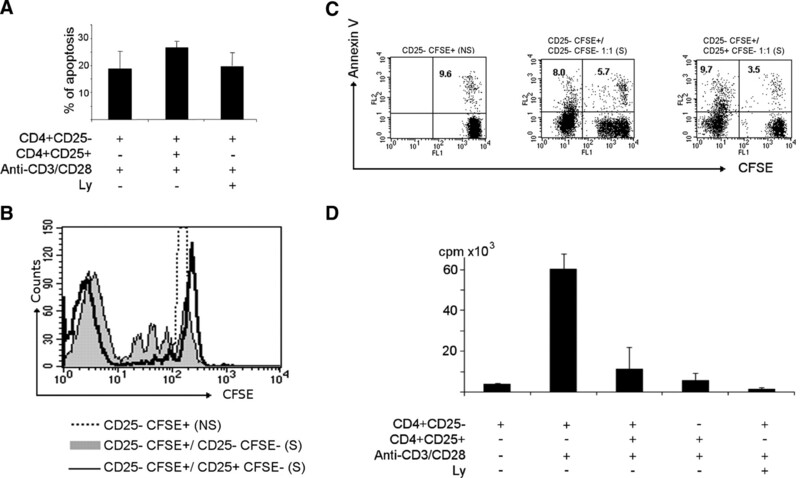 C, CD4+CD25− T cells were labeled with CSFE and left either not stimulated (NS, left panel) or stimulated with soluble anti-CD3 (0.75 μg/ml) and anti-CD28 (4 μg/ml) Abs for 3 days, in the presence of either unlabeled CD4+CD25+ cells (middle panel) or unlabeled CD4+CD25+ cells at 1:1 ratio (right panel). Annexin V and CFSE staining were compared after a 3-day culture in a gate including all cells. Numbers in quadrants are the percentages of annexin V positive cells. Similar results were obtained using immobilized anti-CD3 (0.5–1 μg/ml) and soluble anti-CD28 (1 μg/ml). 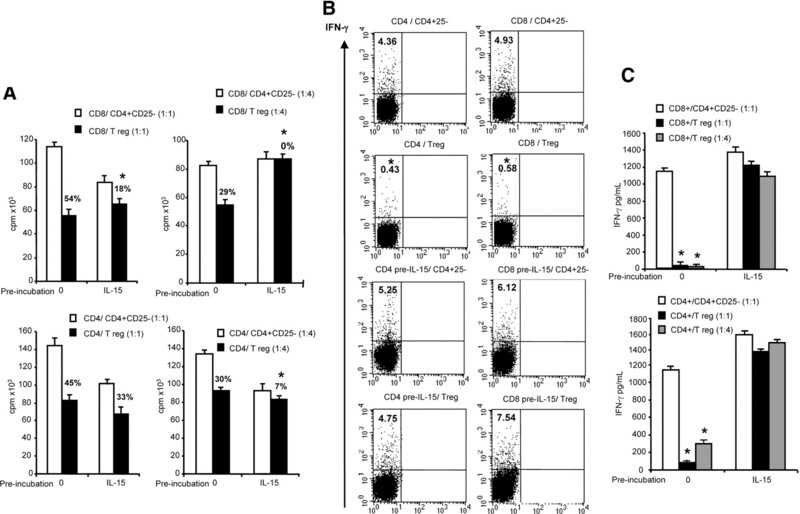 D, Proliferation of CD4+CD25− responder cells stimulated by immobilized anti-CD3 (0.5–1 μg/ml) and soluble anti-CD28 (1 μg/ml) Abs in the presence or not of Ly and cocultured or not with CD4+CD25+ cells was assessed by [3H]thymidine uptake in the same experiment. Data are representative of four distinct experiments. Our data point out to the ambiguous role of IL-15 in the control of Treg functions and demonstrate that IL-15 promotes the effect of TGF-β on the de novo generation of Tregs but also renders peripheral CD4 and CD8 T cells resistant to the suppressive functions of Treg through activation of the PI3K signaling pathway. FOXP3 expression was induced in human CD4+CD25− T cells stimulated by anti-CD3 and anti-CD28 Abs which did not exhibit any Treg functions, confirming previous observations that, in humans, FOXP3 is not a reliable marker of human suppressor cell activity and can simply reflect T cell activation. In keeping with the presence of STAT5 binding sites in the promoter and in one enhancer of the FOXP3 gene (32), recent data have shown that induction of FOXP3 in stimulated human T cells depends on the activation of STAT5 by the γc cytokines IL-2, IL-7, or IL-15 (33). Yet, STAT5-driven induction of FOXP3 was not sufficient to acquire regulatory properties. This result is coherent with our data showing the lack of suppression by CD4+CD25− T cells activated by anti-CD3/CD28 added or not with IL-15 or IL-2. By contrast, adding TGF-β during the stimulation of CD4+CD25− T cells by anti-CD3 and anti-CD28 Abs resulted in the induction of regulatory properties. In mice, the presence of exogenous TGF-β is necessary during the stimulation by anti-CD3/CD28 Abs to induce both FOXP3 and regulatory functions, and TGF-β plays a nonredundant role with IL-2 in the induction of FOXP3 (11, 34, 35). In humans, adding exogenous TGF-β may not be necessary as Tran et al. observed that 30% of naive CD4+ T cells expressed FOXP3 in response to TCR stimulation alone. Yet, induction of FOXP3 was prevented by neutralizing TGF-β, and adding TGF-β further increased the proportion of FOXP3+ cells to 80%, confirming the role of this cytokine (35, 36). In our study, FOXP3 mRNA levels increased only very modestly in the presence of exogenous TGF-β and there was no significant increase in level of expression of FOXP3 or proportion of FOXP3+ cells in CD4+ T cells as compared with cells only stimulated by anti-CD3/CD28 Abs. The impact of exogenous TGF-β may depend on the amounts of TGF-β produced in response to TCR stimulation and/or on the different concentrations of TGF-β present in the serum used for the assay (35). In mice, TGF-β was suggested to stimulate FOXP3 transcription through Smad3 binding to an inverted repeat sequence situated in a 120-bp enhancer fragment on the murine FOXP3 gene (37). This result may appear paradoxical given the synergistic effect of IL-15 and TGF-β on the de novo generation of human Treg observed in the present study and our previous data indicating that IL-15 inhibits Smad3-binding to the promoters of TGF-β target genes in human T cells (3). Yet, Von Boehmer and Nolting (32) have stressed the role of additional Smad3-independent mechanism(s) in TGF-β-dependent induction of FOXP3 transcription in murine T cells. Furthermore, our results suggest that TGF-β promotes the generation of human Treg independently of FOXP3 induction. Altogether, these results point out to the likely role of Smad3-independent effect(s) of TGF-β in the generation of Treg, notably in humans. Contrasting with its promoting effect on the in vitro generation of Treg, IL-15 hampered the capacity of conventional CD4+ or CD8+ T cells to respond to the immunosuppressive effects of natural Treg. IL-15 acted preferentially on CD8+ T cells either naive or memory while the related cytokine IL-2 had a preferential effect on memory lymphocytes, particularly CD4+. These results are in keeping with the known distribution of IL2 and IL-15 receptor chains on T cell subsets (30). We found no evidence that IL-15 may modulate NFATc2 recently involved in the capacity of murine effector cells to respond to Treg (28). In contrast, our results point to the central role of the PI3K pathway. Phospho-Akt was induced after IL-15 stimulation, particularly in CD8+ T lymphocytes and inhibition of PI3K pathway impeded IL-15 effects on responder cells. The key role of PI3K pathway in inducing resistance to suppressive effects of Treg is in keeping with the recent hypothesis put forward by Wolfert et al. (38). Based on the observation that several mouse models of autoimmunity either spontaneous (NOD, MLR/Mp, etc.) or in engineered mice (Cbl-b−/−, TRAF6−/− etc.) show simultaneous resistance of effector T cells to Treg and hyperactivity of the PI3K/Akt pathway (38), these authors postulated that the activation status of the PI3K/Akt pathway in conventional T cells is a primary determinant of cell sensitivity to Treg-mediated suppression. The role of PI3K/Akt pathway in regulating Treg-mediated suppression remains, however, unclear. Considering the recent data obtained by Pandiyan et al. (31), we tested whether CD4+CD25+ Treg exert their suppressive effects by inducing apoptosis of effector T cells and whether IL-15, alike other γc cytokines may impair this effect by activating PI3K/Akt pathway. We were, however, unable to demonstrate that suppression of effector cells was associated with their significant apoptosis. Furthermore, inhibitors of PI3K pathway failed to induce any significant apoptosis in stimulated CD4+CD25− responsive cells. It is unclear why our data in humans differ from recent data in mice. Yet, our results are consistent with previous studies performed either on mice or humans. Accordingly, Duthoit et al. (39) observed that stimulated CD4+CD25− T cells failed to up-regulate IL-2 mRNA in the presence of Treg, and that exogenous IL-2 did not break the mitotic blockage of stimulated CD4+CD25− T cells cocultured with Treg cells while promoting their survival. Furthermore, Fontenot et al. (40) showed that Foxp3+ CD4+ T cells from IL2ra−/− mice possess equivalent regulatory functions as their counterparts in wild-type mice. Finally, Oberle et al. (41) demonstrated that in humans, suppression of IL-2 and IFN-γ mRNA by Treg cells was not dependent on IL-2 consumption. Besides an effect based on sopping IL-2, a plethora of mechanisms have been evoked in mediating immunosuppression by Treg (42, 43). Future work will be necessary to decipher which of these mechanisms implicate(s) the PI3K/Akt pathway. Finally, it may be stressed that our study analyzes how IL-15 interferes with the direct effect of Treg on effector T cells. Recent studies indicate that Treg can exert their suppressor effect by inhibiting dendritic cell maturation and Ag-presentation (44). Because IL-15 is a potent inducer of both functions (45), it will be interesting to assess whether IL-15 might also prevent this effect of Treg. In conclusion, our in vitro data point to the ambiguous role of IL-15 in the control of Treg functions. On the one hand, IL-15 can promote the generation of induced FOXP3+ Treg. In contrast, IL-15 can render effector cells either CD4+ or CD8+ unresponsive to the regulatory effect of FOXP3+ Treg. The latter effect of IL-15 is reminiscent of IL-6. Thus, IL-6, released by TLR-activated dendritic cells, rendered responder T cells refractory to the suppressive effect of Treg and this effect was suggested to promote a rapid and efficient immune response against pathogens (46). IL-15 is one cytokine rapidly but transiently induced in response to intracellular pathogen (47). The dual effect of IL-15 demonstrated in the present study may be beneficial to promote a rapid inflammatory response to pathogens and simultaneously prepare its subsequent down-regulation after elimination of the pathogen. Conversely, the impact of IL-15 on responding T cells may become deleterious in situations associated with protracted IL-15 overexpression, preventing the return to homeostasis and sustaining inflammation. Overexpression of IL-15 has been observed across a range of proinflammatory and autoimmune-related human diseases including psoriasis, rheumatoid arthritis, and celiac disease (7, 48). Our data indicating that IL-15 counteracts the suppressive action of Treg point to their probable dysfunction in diseases associated with IL-15 disordered overexpression. This effect of IL-15 together with its inhibitory effect on Smad3 signaling, provides further insight on how protracted IL-15 production may contribute to the loss of immune tolerance and further support therapeutic strategy targeting IL-15 in diseases associated with IL-15 deregulation. ↵1 This work was supported by grants from INSERM, Fondation Princesse Grace, Association pour la Recherche Contre le Cancer, Ligue Contre le Cancer, Agence Nationale pour La Recherche, Fondation pour la Recherche Médicale-Equipes 2007, and Association Française des Intolérants au Gluten. N.B.H. was supported by a grant from Le Réseau International des Instituts Pasteur. N.M. is supported by fellowships from Zonmw AGIKO and from the Nutricia Research Foundation. ↵2 M.B.A. and N.B.H. contributed equally to the work. ↵4 Abbreviation used in this paper: Treg, regulatory T cell. Budagian, V., E. Bulanova, R. Paus, S. Bulfone-Paus. 2006. IL-15/IL-15 receptor biology: a guided tour through an expanding universe. Cytokine Growth Factor Rev. 17: 259-280. Ahmed, M. Ben, B. Meresse, B. Arnulf, U. Barbe, J. J. Mention, V. Verkarre, M. Allez, C. Cellier, O. Hermine, N. Cerf-Bensussan. 2007. Inhibition of TGF-β signaling by IL-15: a new role for IL-15 in the loss of immune homeostasis in celiac disease. Gastroenterology 132: 994-1008. Aoki, C. A., A. T. Borchers, M. Li, R. A. Flavell, C. L. Bowlus, A. A. Ansari, M. E. Gershwin. 2005. Transforming growth factor β (TGF-β) and autoimmunity. Autoimmun. Rev. 4: 450-459. Yang, X., J. J. Letterio, R. J. Lechleider, L. Chen, R. Hayman, H. Gu, A. B. Roberts, C. Deng. 1999. Targeted disruption of SMAD3 results in impaired mucosal immunity and diminished T cell responsiveness to TGF-β. EMBO J. 18: 1280-1291. McInnes, I. B., J. A. Gracie. 2004. Interleukin-15: a new cytokine target for the treatment of inflammatory diseases. Curr. Opin. Pharmacol. 4: 392-397. Chen, W., S. Perruche, J. Li. 2007. CD4+CD25+ T regulatory cells and TGF-β in mucosal immune system: the good and the bad. Curr. Med. Chem. 14: 2245-2249. Zhang, L., H. Yi, X. P. Xia, Y. Zhao. 2006. Transforming growth factor-β: an important role in CD4+CD25+ regulatory T cells and immune tolerance. Autoimmunity 39: 269-276. Horwitz, D. A., S. G. Zheng, J. Wang, J. D. Gray. 2008. Critical role of IL-2 and TGF-β in generation, function and stabilization of Foxp3+CD4+ Treg. Eur. J. Immunol. 38: 912-915. Fahlen, L., S. Read, L. Gorelik, S. D. Hurst, R. L. Coffman, R. A. Flavell, F. Powrie. 2005. T cells that cannot respond to TGF-β escape control by CD4+CD25+ regulatory T cells. J. Exp. Med. 201: 737-746. You, S., B. Leforban, C. Garcia, J. F. Bach, J. A. Bluestone, L. Chatenoud. 2007. Adaptive TGF-β-dependent regulatory T cells control autoimmune diabetes and are a privileged target of anti-CD3 antibody treatment. Proc. Natl. Acad. Sci. USA 104: 6335-6340. Kullberg, M. C., V. Hay, A. W. Cheever, M. Mamura, A. Sher, J. J. Letterio, E. M. Shevach, C. A. Piccirillo. 2005. TGF-β1 production by CD4+ CD25+ regulatory T cells is not essential for suppression of intestinal inflammation. Eur. J. Immunol. 35: 2886-2895. Fantini, M. C., C. Becker, I. Tubbe, A. Nikolaev, H. A. Lehr, P. Galle, M. F. Neurath. 2006. Transforming growth factor β induced FoxP3+ regulatory T cells suppress Th1 mediated experimental colitis. Gut 55: 671-680. Peluso, I., M. C. Fantini, D. Fina, R. Caruso, M. Boirivant, T. T. MacDonald, F. Pallone, G. Monteleone. 2007. IL-21 counteracts the regulatory T cell-mediated suppression of human CD4+ T lymphocytes. J. Immunol. 178: 732-739. Karakhanova, S., M. Munder, M. Schneider, M. Bonyhadi, A. D. Ho, M. Goerner. 2006. Highly efficient expansion of human CD4+CD25+ regulatory T cells for cellular immunotherapy in patients with graft-versus-host disease. J. Immunother. 29: 336-349. Yates, J., F. Rovis, P. Mitchell, B. Afzali, J. Y. Tsang, M. Garin, R. I. Lechler, G. Lombardi, O. A. Garden. 2007. The maintenance of human CD4+ CD25+ regulatory T cell function: IL-2, IL-4, IL-7 and IL-15 preserve optimal suppressive potency in vitro. Int. Immunol. 19: 785-799. Bopp, T., A. Palmetshofer, E. Serfling, V. Heib, S. Schmitt, C. Richter, M. Klein, H. Schild, E. Schmitt, M. Stassen. 2005. NFATc2 and NFATc3 transcription factors play a crucial role in suppression of CD4+ T lymphocytes by CD4+ CD25+ regulatory T cells. J. Exp. Med. 201: 181-187. Cantrell, D.. 2002. Protein Kinase B (Akt) regulation and function in T lymphocytes. Semin. Immunol. 14: 19-26. Ma, A., R. Koka, P. Burkett. 2006. Diverse function of IL-2, IL-15 and IL-7 in lymphoid homeostasis. Annu. Rev. Immunol. 24: 657-679. Pandiyan, P., L. Zheng, S. Ishihara, J. Reed, M. J. Lenardo. 2007. CD4+CD25+Foxp3+ regulatory T cells induce cytokine deprivation-mediated apoptosis of effector CD4+ T cells. Nat. Immunol. 8: 1353-1362. Von Boehmer, H., J. Nolting. 2008. What turns on Foxp3?. Nat. Immunol. 9: 121-122. Passerini, L., S. E. Allan, M. Battaglia, S. Di Nunzio, A. N. Alstad, M. K. Levings, M. G. Roncarolo, R. Bacchetta. 2008. STAT5-signaling cytokines regulate the expression of FOXP3 in CD4+CD25+ regulatory T cells and CD4+CD25− effector T cells. Int. Immunol. 20: 421-431. Davidson, T. S., R. J. DiPaolo, J. Andersson, E. M. Shevach. 2007. Cutting edge: IL-2 is essential for TGF-β-mediated induction of Foxp3+ T regulatory cells. J. Immunol. 178: 4022-4026. Shevach, E. M., D. Tran, Q. T. S. Davidson, J. Andersson. 2008. The critical contribution of TGF-β to the induction of Foxp3 expression and regulatory T cell function. Eur. J. Immunol. 38: 915-917. Tran, D. Q., H. Ramsey, E. M. Shevach. 2007. Induction of FOXP3 expression in naive human CD4+FOXP3−T cells by T-cell receptor stimulation is transforming growth factor-β-dependent but does not confer a regulatory phenotype. Blood 110: 2983-2990. Tone, Y., K. Furuuchi, Y. Kojima, M. L. Tykocinski, M. I. Greene, M. Tone. 2008. Smad3 and NFAT cooperate to induce Foxp3 expression through its enhancer. Nat. Immunol. 9: 194-202. Wohlfert, E. A., R. B. Clark. 2007. Vive la resistance! : the PI3K-Akt pathway can determine target sensitivity to regulatory T cell suppression. Trends Immunol. 28: 154-160. Duthoit, C. T., D. J. Mekala, R. S. Alli, T. L. Geiger. 2005. Uncoupling of IL-2 signaling from cell cycle progression in naive CD4+ T cells by regulatory CD4+CD25+ T lymphocytes. J. Immunol. 174: 155-163. Oberle, N., N. Eberhardt, C. S. Falk, P. H. Krammer, E. Suri-Payer. 2007. 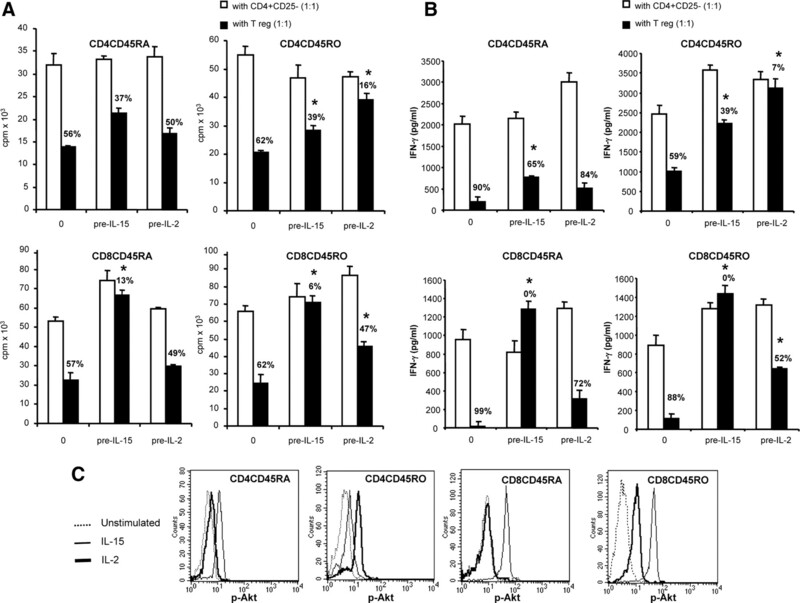 Rapid suppression of cytokine transcription in human CD4+CD25− T cells by CD4+Foxp3+ regulatory T cells: independence of IL-2 consumption, TGF-β, and various inhibitors of TCR signaling. J. Immunol. 179: 3578-3587. Vignali, D.. 2008. How many mechanisms do regulatory T cells need?. Eur. J. Immunol. 38: 908-911. Onishi, Y., Z. Fehervari, T. Yamaguchi, S. Sakaguchi. 2008. Foxp3+ natural regulatory T cells preferentially form aggregates on dendritic cells in vitro and actively inhibit their maturation. Proc. Natl. Acad. Sci. USA 105: 10113-10118. Mohamadzadeh, , M. F. Berard, G. Essert, C. Chalouni, B. Pulendran, J. Davoust, G. Bridges, Palucka, J. Banchereau. 2001. Interleukin 15 skews monocyte differentiation into dendritic cells with features of Langerhans cells. 194: 1013-1020. Mention, J. J., M. Ben Ahmed, B. Begue, U. Barbe, V. Verkarre, V. Asnafi, J. F. Colombel, P. H. Cugnenc, F. M. Ruemmele, E. McIntyre, et al 2003. Interleukin 15: a key to disrupted intraepithelial lymphocyte homeostasis and lymphomagenesis in celiac disease. Gastroenterology 125: 730-745.